Another wonderful classic novella by Margaret Lynette Sharp, Change Comes to Pemberley features Juliette, the daughter of the Darcys. Juliette has fallen in love with Stephen Woods, a master in playing the pianoforte. Juliette’s father is uncertain of his daughter’s relationship. Even though he realizes the need to let his children choose their future partners based on love, he is having a hard time allowing himself to let his daughter be with Mr. Woods. Woods's career is demanding and requires him to be on the road constantly. He is also not from an affluent family. Will Juliette’s mother be able to save the day once again with her wisdom or is the situation already doomed? As in any other of Margaret Lynette Sharp’s short stories, the characters in the book are very well developed. They face a quagmire that threatens Juliette’s happiness as she is deeply in love. Woods's further revelation heightens the difficulty in developing a solution for the parties involved, which makes the story even more entrancing. The story proceeds at an appropriate pace, letting each scene sink in. The dialogues are the highlights of the story. The remarks by the characters, especially Lady Catherine, helped me understand the story line even better. These remarks also gave me a glimpse into the characters’ thoughts. The inclusion of a conflict within the romantic story is very well executed, especially because the problem seems to have no solution. 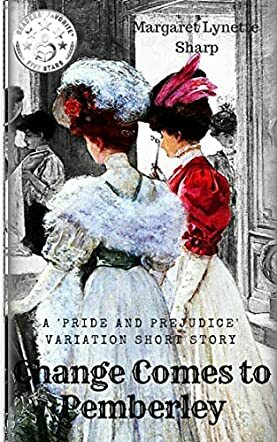 Overall, Change Comes to Pemberley is splendid reading, like the other stories by Margaret Lynette Sharp.